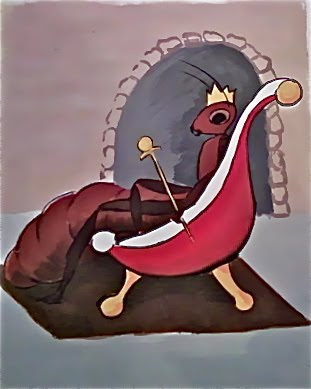 Judy A Goddard, Artisan: Whimsey Wednesday: The Queen is now amused! Whimsey Wednesday: The Queen is now amused! Well, here she is! In all her glory! She's waiting for her subjects to return with the day's food. They adore her. She's a good queen and a great mother! This is my first professional illustration job. I certainly hope it leads to many more! I would say it should...amazing rich colors, and the Queen has such a strong pose...great artwork, and nice story to add to her glory as Queen! Congratulations on your illustration job! I love her. She's quite regal dahling.